Create a place of wonder and enchantment for tiny worlds. 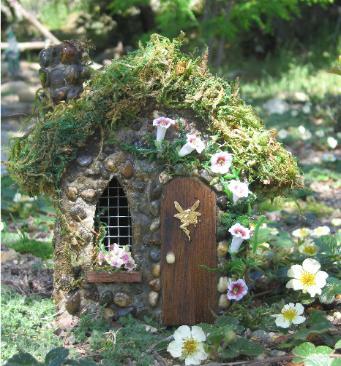 A miniature garden whether inside or outside of your home is sure to draw the attention of fairies and welcome them into your space. You never know who may come calling. 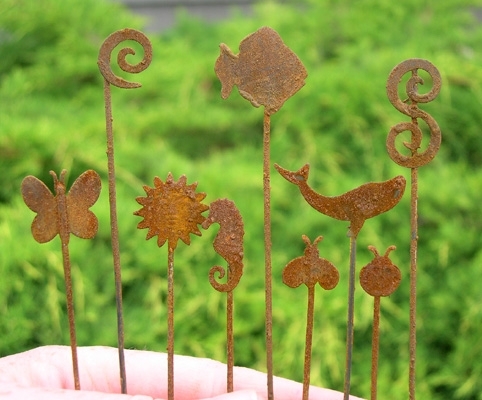 Watching for fairies and butterflies to visit your little garden abode is fun. Choose a corner of the garden, or you can place your fair space next to a grand tree, where you can prop a simple fairy house made of twigs found on the ground. We also love the idea of being able to move the fairy garden. Perhaps they appreciate the energy of new scenery as much as we do. If you choose portability, possibilities for containers are everywhere — shallow trays or bowls, discarded bureau drawers, drawers from wooden jewelry boxes, shells, and clay saucers. Broken containers such as teapots and cups and clay pots (bury the sharp edges in soil away from little hands) are as charming as whole ones, as in the wild they have learned to live happily with what bits they can find. Some friends even painted pictures on tiny canvases. Toy or craft stores are loaded with miniature items like tiny watering cans, animals and chairs. Make a swing set from twigs and vines. Rocks and barks can be stepping stones or encircle a fairy “tree” plant. We love moss and thyme and so do faeries! Mosses come in many varieties simulating grasses and bushes. Find them under trees that get little light, especially on the north side. If you are looking for a large bit of moss, or specialty mosses, try moss acres online. Herbs and Flowers: To give interest and aroma, use low-growing herbs such as thyme, especially adored by fairies, and rosemary. Give your Dwarf zinnias, marigolds, violets, ivy, baby’s tears and sprigs of vinca a good start in potting soil. See our page on plants and flowers. INSPIRED WHIMSICAL TOUCHES: Add little bells, metal or bead charms from old bracelets or necklaces , miniature flower pots and saucers from a miniatures shop or doll house store. For brainstorming, think of what little objects from everyday life little eyes would find just around your neighborhood — nut shells, bits of yarn and string, metal washers, wire and old springs, bits of shell, bits of broken tile or crockery, not to mention branches and clusters that have fallen to the ground. It is lovely to add bits of torn silk or cotton for flags, bed covers and chairs. Even though they won’t last forever, the wee folk appreciate them. First things first: Always bring a fairyish snack. (It’s mostly for you and your guests, including fairies) because once you start this project, time will pass quickly. Many years ago we made an Enchanted Broccoli forests vegetable tray, with little cheese star cutouts and miniature biscuits. Include a little dish of honey — a doll house saucer is just fine. If your chosen container is not waterproof, begin by lining it with heavy duty plastic. Add potting soil, leaving at least an inch or two to accommodate landscaping materials. Choose diminutive plants, add a good sprinkling of various found objects to add charm and character to the fairy garden. Use natural materials such as wood, stone, metal, sand, glass. A small mirror from an old compact makes a gazing pool and a clear marble make a fine gazing ball. Tiny garden accessories like benches, arbors, tiny shovels and trowels, are especially enchanting.The flattened glass beads used in the bottoms of flower container are amazing — and some come in star shapes. Beds and benches can be handmade or purchased. These whimsical gardens can go wherever your imagination takes you. When you are done, and you place your portable garden, or finish up your permanent outside garden, call the faeries by blowing some bubbles or singing a little song. Recite a little fairy poem. Think about fragrances as well as colors when choosing flowers. In the book, CREATING FAIRY GARDEN FRAGRANCES by Linda Gannon & Dagmar Fehlau, they say “Create garden fragrances that summon the mirth and mischief of enchanted creatures into your home. It will help you celebrate the wonder of the changing season with bewitching combinations of dry flowers, herbs and fruits. http://www.miniature-gardens.com/ flag stones, miniature bricks, beekeeps, buckets, signs, wreaths and watering cans, bridges, arbors. And fairy houses, of course.